When it comes to illuminating your home, you may be thinking the process is as easy as going to the local home improvement store and picking up a case of glass bulbs that promise to light up. Modern lighting, however, provides a plethora of options to better meet the unique needs of today’s consumers. Technology has helped us to create more control and convenience when it comes to residential lighting. Anyone seeking a lighting store in Omaha will be pleased when they enter The Light Palace. Our comprehensive showroom supplies all of the home lighting fixtures and accessories you need to cover your place in pride. Since the early 1950s, our lighting experts have outfitted Nebraskans with the best solutions in the business. 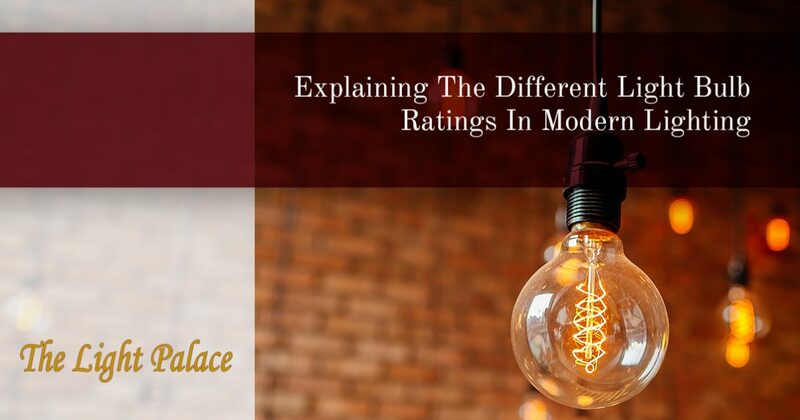 Today, we’ll take a look at the different ratings associated with modern light bulbs and how they can affect the result of your home illumination. When you’re in need of outdoor, bedroom, bathroom, living room, kitchen lighting and more, be sure to stop by our lighting store today! This number is simply the measurement of how much energy a light bulb uses. The lower the watt rating on the package, the lower your electric bill will be. Watts were initially useful for determining the brightness of incandescent bulbs, as power relates directly to illumination. A 40-watt bulb would ideally be half as bright as an 80-watt option. However, newer light bulbs have managed to produce much more illumination with less power, negating the value of wattage for brightness. Today’s shoppers should look at the lumens for effectively choosing their ideal lighting option. This measurement system is useful for identifying how much light you want from a single light bulb. Typically, it helps to think of one lumen as the equivalent of one candle for illumination that is one foot away from you. Modern lighting requires lumens as the rating for nearly all lighting applications. Incandescent bulbs that utilized 75 watts, for example, would provide 1,100 lumens of light. A 60-watt bulb of this variety produced 800 lumens and so on. An LED light, on the other hand, can create 1,100 lumens while only requiring roughly 18 watts. Because of this new energy-efficient technology, it’s easy to see why lumens are now the most important value when shopping for exterior or indoor lighting. Homeowners will be able to determine the brightness they want, then move on to the wattage to determine the efficiency of their product. Beyond the brightness, you’ll be looking for the perfect color that a light bulb can produce to optimally illuminate your home. It’s essential to find the correct color temperature to match your intended mood or activity. Measured on the Kelvin scale, the color of light can range from soft yellows to bright daylight tones. Many people prefer the warm glow over any bright industrial options. Low-color CFL and LED bulbs are now available to provide comforting tones for a variety of applications. Matching the colors and tones of lighting in your home is essential for avoiding a cataclysm of colors that may prove to be too much for comfort. It’s important to find the right lighting for illuminating the different colors in your home, but bulbs that are too intense can create a disco ball of tones. The color rendering index, or CRI, is an aggregate score that ranges from 1 to 100 that rates a light bulb’s capability for accurately lighting up colors. To make this more understandable, you can think of sunshine as the perfect source of light, receiving a CRI of 100 for perfectly illuminating colors. A light bulb with a low CRI will not reflect correctly, making it harder for the human eye to detect different shades and tones. Bulbs that provide white or natural light tend to be the source for CRI scores, as they sit close to the middle of the color spectrum. This rating may not be mandatory or even necessary for your home lighting fixtures, but the distinction can help to create better results in certain applications. Our lighting pros are here if you want to learn more about this complicated science! The lighting labels that are required by the US Federal Trade Commission are helpful in finding the ideal light for your needs. From the expected life span to yearly cost, energy efficiency, and more, everything you could ever need to know before making a purchase is included in an easy-to-read label. Finding the right light bulb will rely on a number of unique ratings and measurements to give you as the project lead the power to more accurately meet your ideal lighting goals. The Light Palace is proud to be your go-to lighting store in Omaha for more than 60 years. With an expansive inventory and knowledgeable staff, we’re confident that you’ll leave our lighting showroom happy. Stop by our store today or shop online to find the best products for your home!